University of Washington is one of the most active universities in the field of Virtual Worlds and one of the rare ones delivering a certificate in Virtual Worlds, under Randy Hinrichs’ leadership. Like last year, 3DXplorer is one of the few platforms being studied during this course, in 2010. Last week, I was pleased to speak to this group of very motivated and skillful students, and share with them some elements of our vision, at Altadyn. The evolution of the 3D and especially the web 3D technologies in the past 20 years, different generations of web3D, the corporation requirements for live collaboration technologies based on virtual worlds , other market requirements , as well as the future trends, were among the subjects we covered. 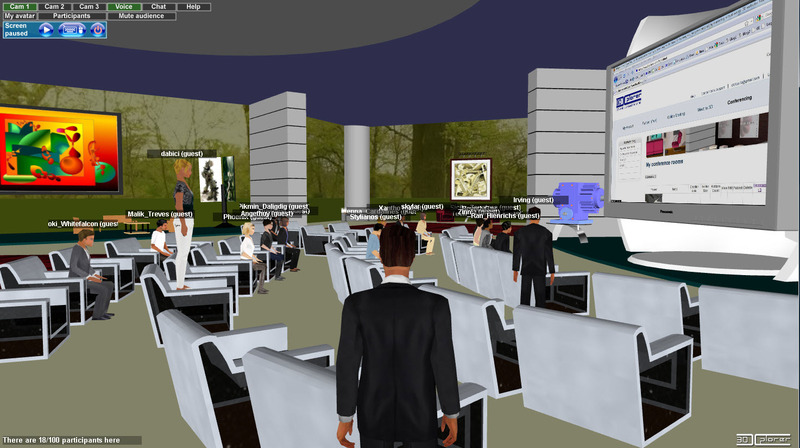 The above are pictures of last week’s virtual classroom in one of the 3DXplorer conference rooms. I enjoyed the event and look forward to seeing all the 2010 students playing an active role in this market soon, if not already. US Air Force project done on 3DXplorer by Aptima. 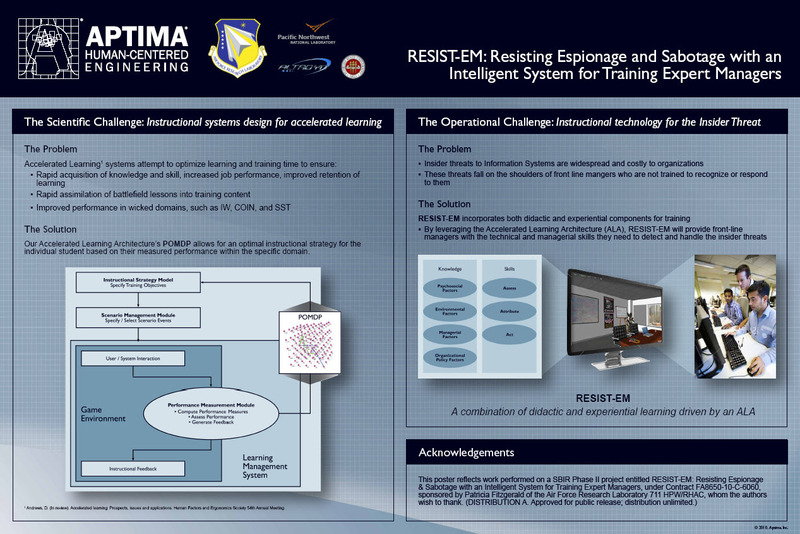 Aptima’s Dr. John Feeney is presenting a poster on their work done with the US Air Force Research Lab, during the Federal Consortium for Virtual World (FCVW) annual event, at the National Defense University in Washington D.C., on May 13th and May 14th , 2010. Aptima Inc., a leader in Human Centered Engineering with offices in Washington DC, Boston and Ohio is an early Altadyn customer using 3DXplorer. Learn more about Aptima here. We are now supporting AMAZON EC2 web services by offering standard pre-configured instances with 3DXplorer, ready for customers’ virtual events. The easy replication of these instances enables Virtual Tradeshows with over 50,000 attendees over a few days to go full immersive 3D. Amazon Elastic Compute Cloud (Amazon EC2) is a web service that provides resizable compute capacity in the cloud. It is designed to make web-scale computing easier and more accessible. High Performance, Reliable, Flexible, Inexpensive, Accessible, Highly Scalable and Easy-to-set-up, … all the criteria are gathered for using AMAZON EC2’s web services for virtual events. Very large Virtual Trade-shows can now be scaled up at a fraction of the cost of alternative solutions, while offering full immersion and interactivity, thanks to the replication of 3DXplorer spaces over the cloud. 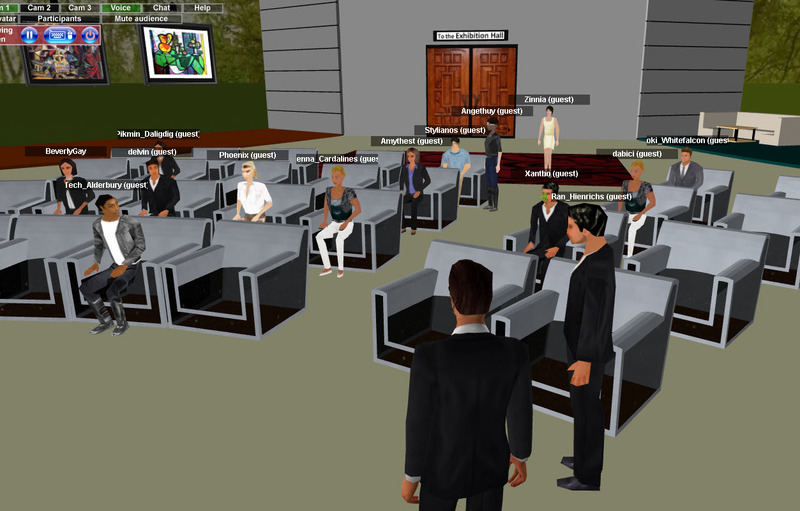 Mid-size publishers, conference organizers and trade-show professionals of any size can now develop high-end 3D immersive virtual events solutions, without spending for costly infrastructures. They can use the high-end platform tailored exactly to their needs, with reliable and performing servers in the right geography (East Coast US, West Coast US, Europe, Asia), for just a few days (duration of the event). New Release, 3DXplorer V5.02.00 is Live Today! 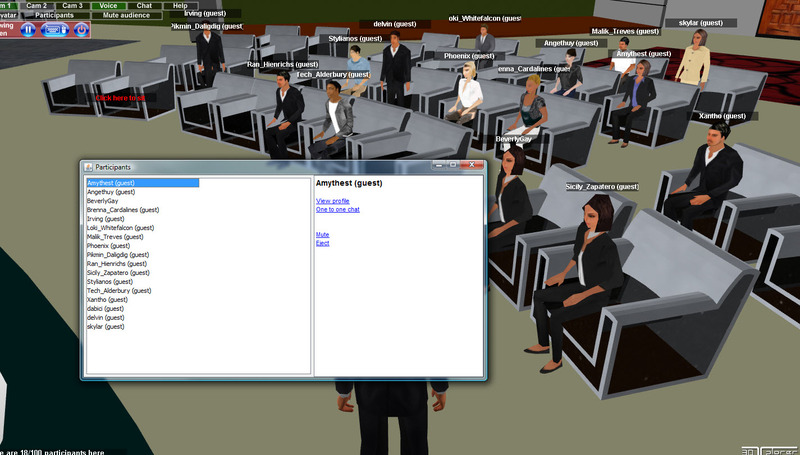 Attendees can see the list of other participants, and start communicating / interacting with them, either by clicking on their avatars, or through the list. Moderators can also interact with participants either graphically or through the list. New buttons have been added to enable the above features. They are all regrouped in the upper left corner of the screen. The avatar’s control pop-up (the former chat) has been removed. The chat window can be started by pressing on the chat button and it will pop up automatically on other attendees window. Avatars’ animations, when possible (ie: high res avatars) are now accessible under “My Avatar” button. When linking a video to a screen, It’s now possible to either have it “broadcast in-sync” so that start /stop of the video , by a moderator or a VIP, will happen simultaneously for all users, or keep the former asynchronous mode, having users watch their video “on demand”. This release is up and running as of today, March 13th , 2010. And remember, no installation, no update, no download required…Enjoy it.